Every single website we use day to day has rules of the road — terms and conditions that apply to what we can do on the site, how we can use it, and so much more. 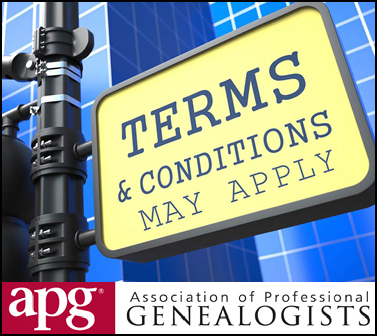 Join The Legal Genealogist for an overview of website terms and conditions and how they affect us as genealogists in a free webinar sponsored by the Association of Professional Genealogists next Wednesday, December 11, at 9 p.m. EST (8 p.m. CST, 7 p.m. MST and 6 p.m. PST). After December 11th, the recording of this webinar — like all recordings of the APG webinars — will be available to APG members only. So be sure to reserve your seat now for next week’s webinar. Better yet, join APG and get access to this and all the recorded webinars in the APG series — plus a whole lot more in member benefits!